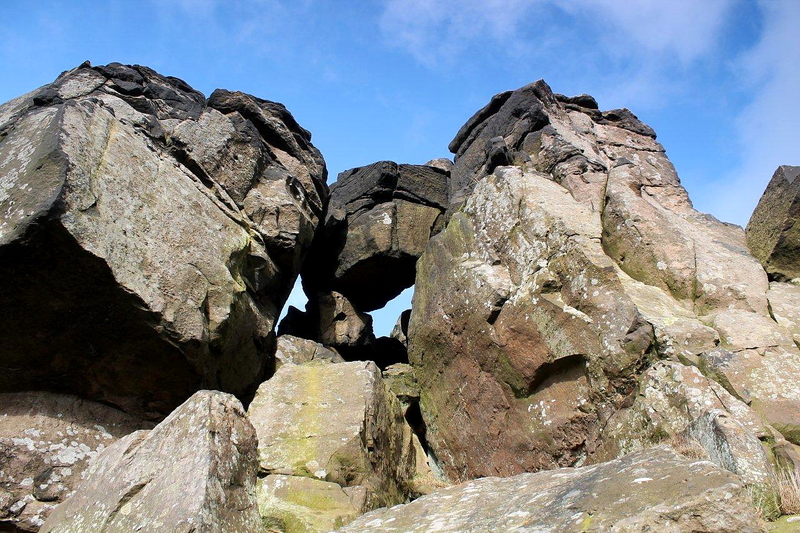 FOR many years I lived under the misguided impression that Ewan MacColl’s iconic mountain song The Manchester Rambler included a mention of the Wain Stones in the Cleveland Hills. 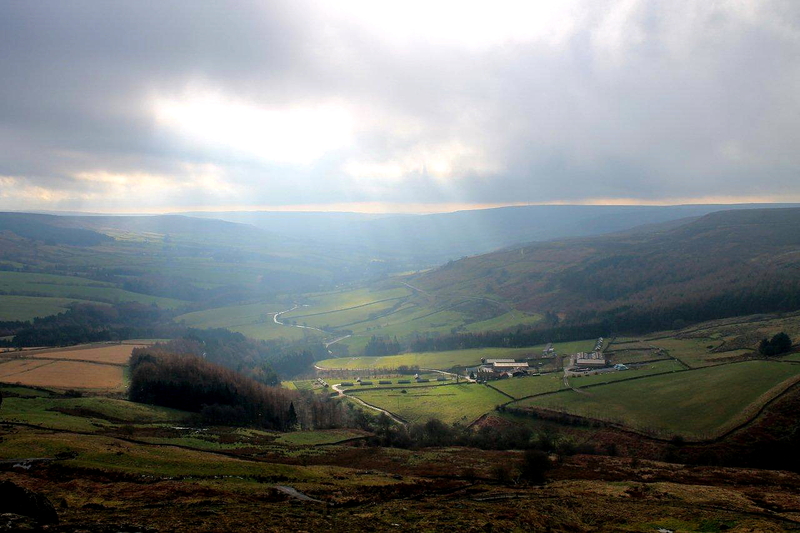 Only recently did I discover there is another set of Wain Stones – on Bleaklow, in the Pennines above Manchester. And these are the ones he was singing about. Which just goes to show that you should never make assumptions . 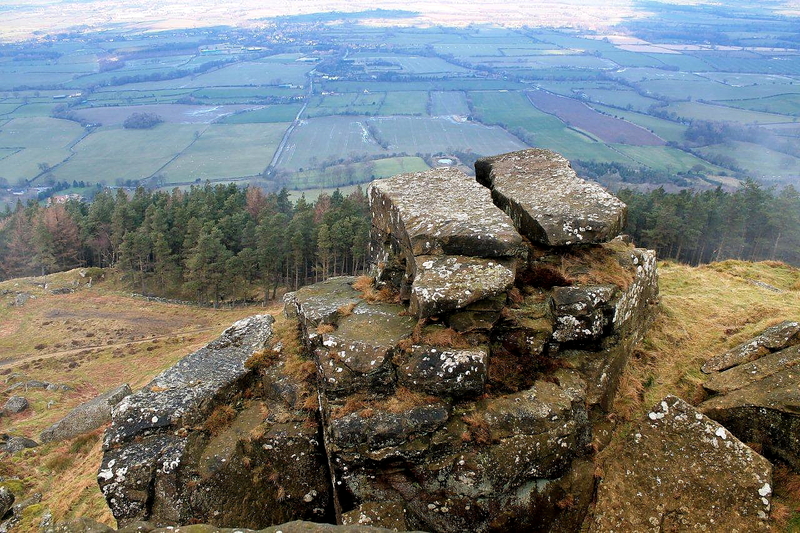 . .
I’ve walked past the Wain Stones several times during the past few years – the North-East version, that is. 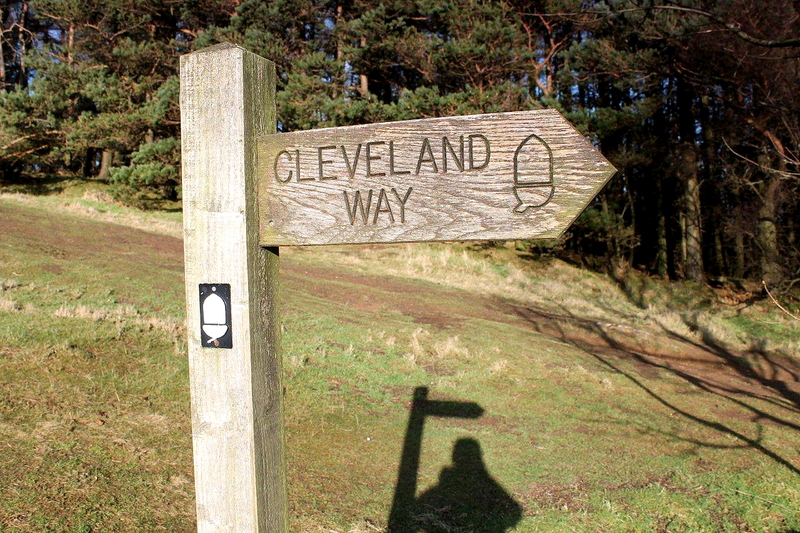 The Cleveland Way long-distance footpath passes directly over the sandstone outcrop. 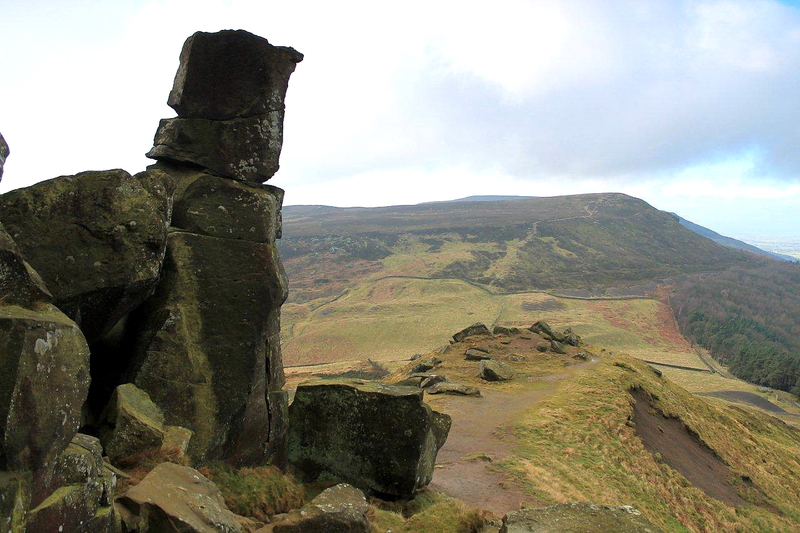 There aren’t many rocky protuberances on the Cleveland Hills and North York Moors, so the Wain Stones are pretty unique in this part of the world. 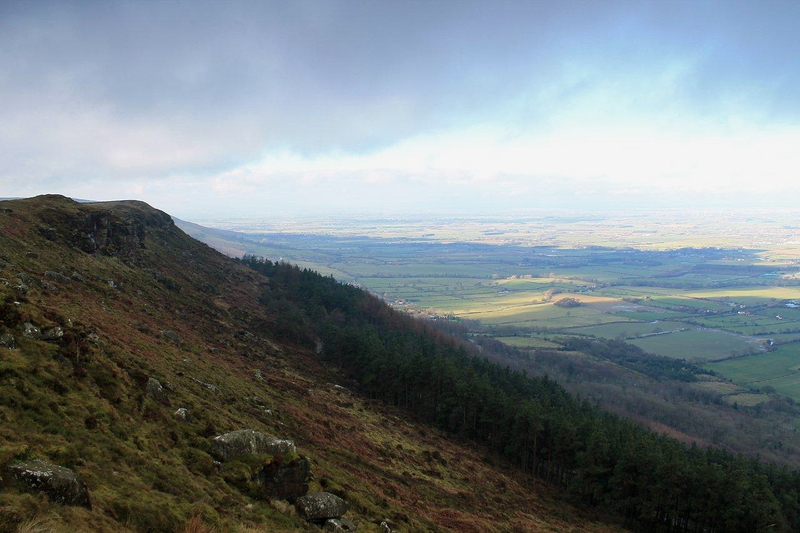 I’ve a few hours to spare today so I’m taking one of my guerilla walks along the escarpment from the B1257 on Clay Bank, heading west towards Carlton Bank and the rolling moors above the Tees valley. 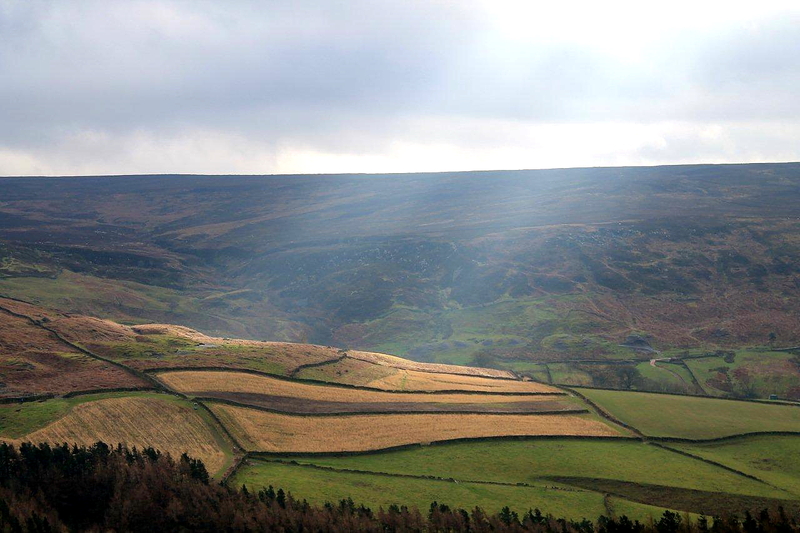 I’ve never quite worked out where the Cleveland Hills finish and the North York Moors begin. 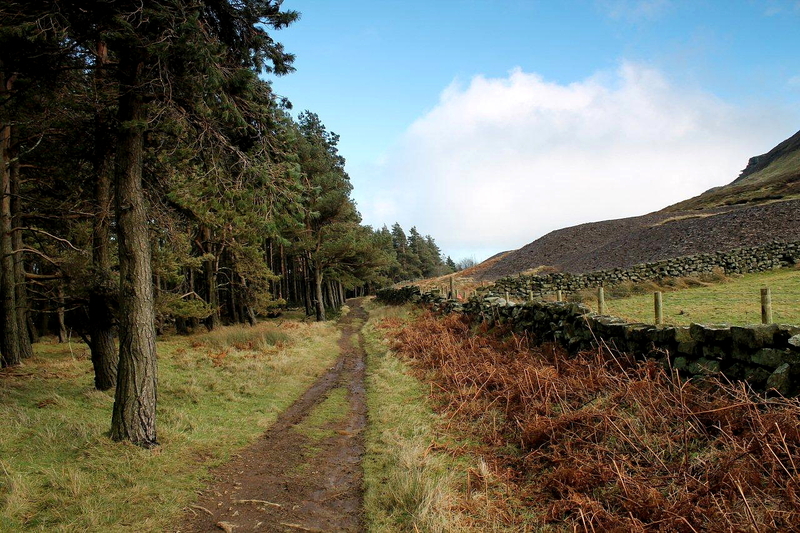 I’ve arrived at the conclusion, unsatisfactory as it might be, that the Cleveland Hills is just another name for the northern section of the North York Moors. That’s the theory I’m working on. And many more things I can tell. Thank you. 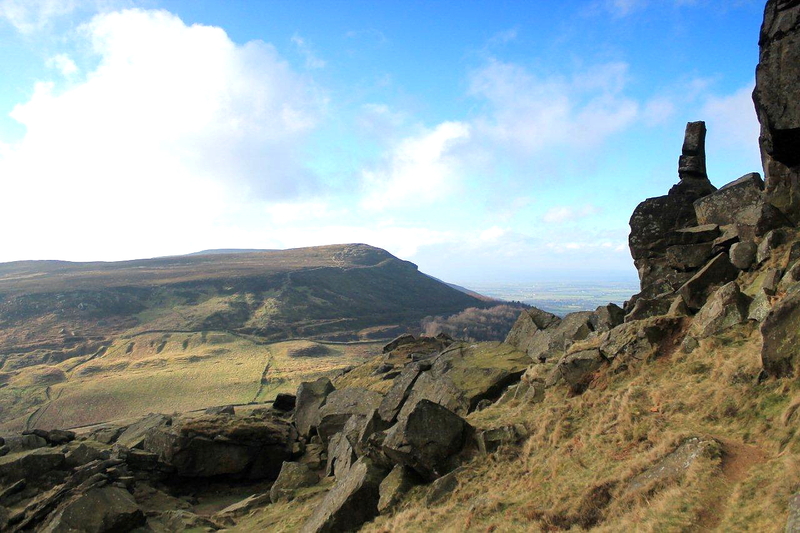 Legend has it that a Viking chieftain was defeated by the Angles up here on this ridge in the Cleveland Hills, and the Wain Stones take their name from the Anglo-Saxon word wanian, which means to lament or grieve. The Vikings certainly rampaged through the vicinity on numerous occasions. Norwegian king Harald Hardrada and his ally, Tostig Godwinson, pillaged Cleveland in September 1066 before ransacking Scarborough and sailing up the River Ouse to meet a bloody death at Stamford Bridge. The Wain Stones are steeped in history. Bronze Age rock carvings have been found on their surfaces. The carving has continued to the present day; the most recent one I discover is dated 2011. I can’t get my head around this, the mentality that prompts people to chisel their initials into a natural object that has weathered countless thousands of winters. 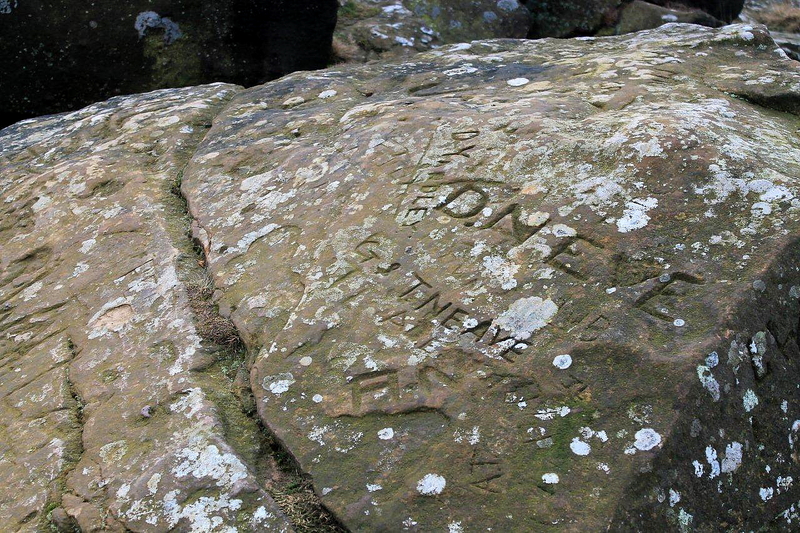 Bronze Age inscriptions are one thing; Victorian lovers leaving their mark in an age when the environment was systematically exploited is another; but supposedly educated people defacing prominent landmarks in a national park is something I have difficulty coming to terms with. Still, I suppose it’s not as bad as pillaging Cleveland. 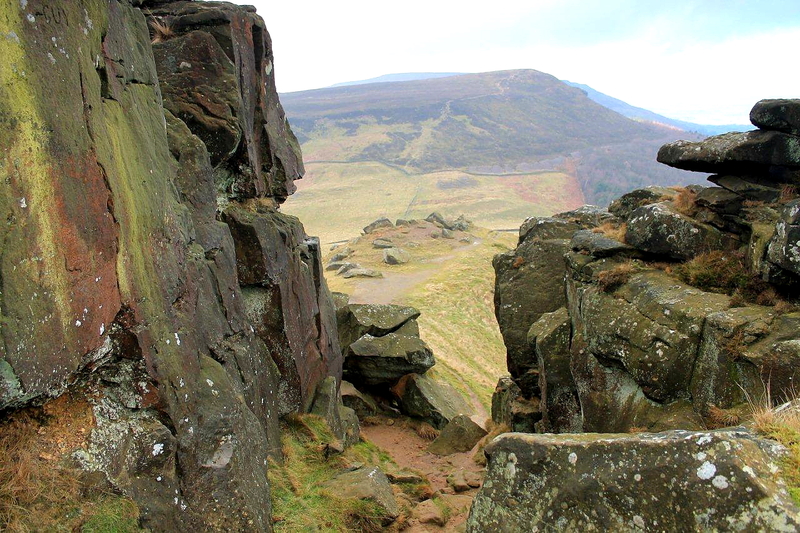 The Wain Stones are also a popular destination for climbers. 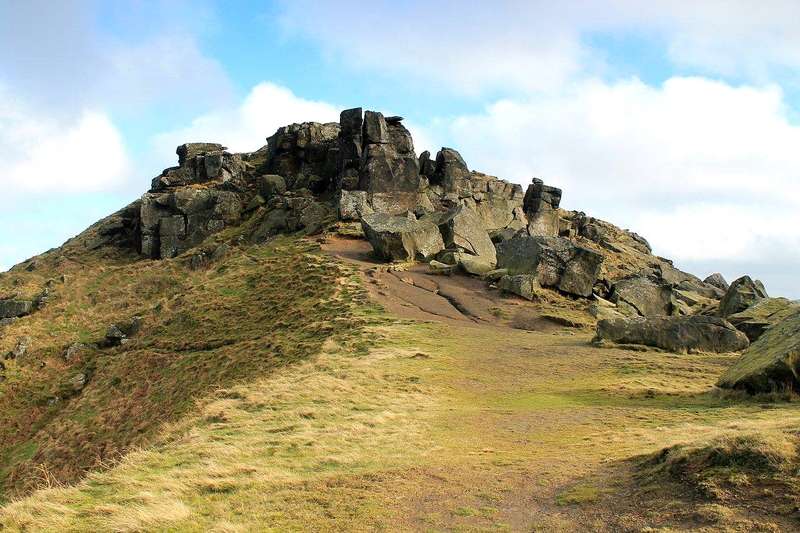 This cluster of sandstone buttresses and boulders might be small and seemingly insignificant in the grand scheme of mountaineering things, but according to the Climb Online website there are 89 routes to the top. When the surrounding boulders and craglets are included, the total reaches 145. The brothers CE and D Burrow along with Canon Newton recorded visits in 1912, they were joined about this time by E and G Creighton, the latter being sufficiently keen to cycle the 80-mile round trip from York to enjoy the climbing. In fact, the visits of E Creighton continued into the period of the First World War when, armed with a revolver, he patrolled the Wainstones in hours of darkness, “Looking for Zeppelins”. There are no Zeppelins today. There might well have been one or two about yesterday, but in this wind they will have been blown up to North Utsire by now. 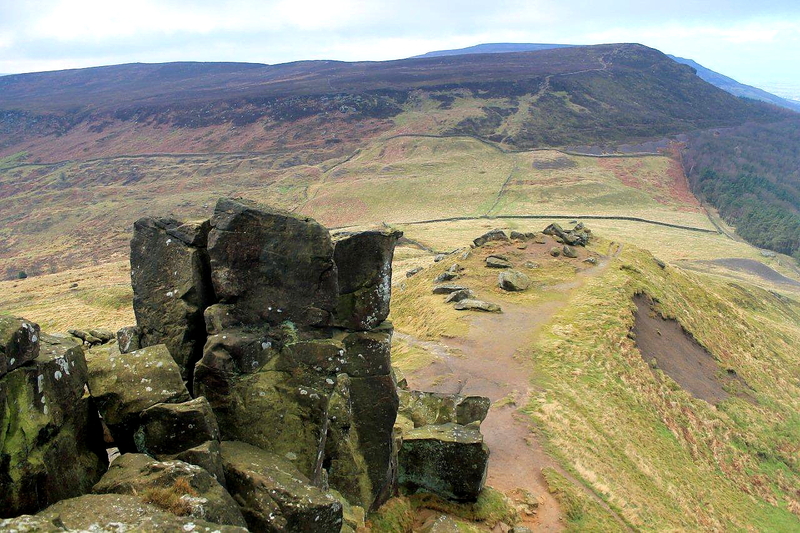 So with no threat from the air I take loads of pictures of rock faces and boulders, clump over the next hill – Cringle Moor – then decide I don’t want to continue any further so turn around and head back along the escarpment. Descending Hasty Bank I meet an elderly gentleman – mid-70s or possibly older – who’s making the ascent to the Wain Stones with the aid of trekking poles. 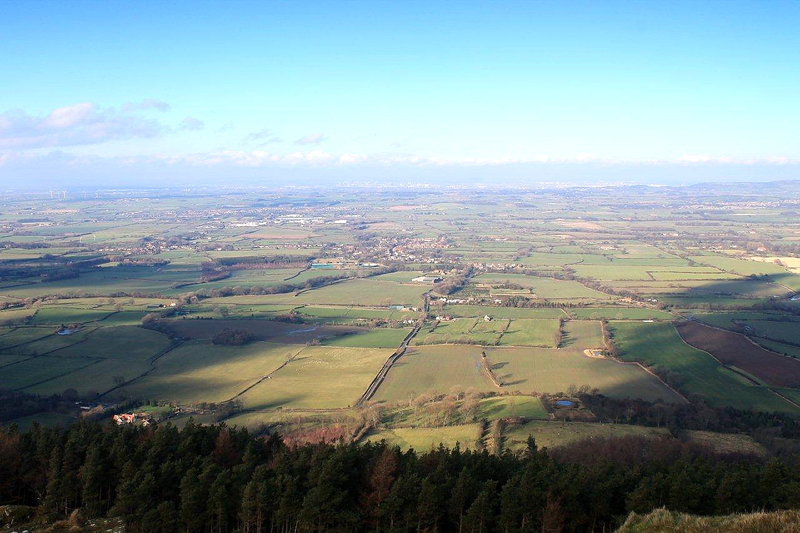 We spend a pleasant ten minutes chatting about the moors, the paths, and the fine views across Teesside from the escarpment. He tells me he’s up here to give his cardiovascular system a workout – which is a relief because my wandering mind has already raised the possibility of him being Mr E Creighton with a revolver stuffed precariously inside his trousers. The last thing I need is a bullet accidentally launching through my foot. We wish each other well and off he goes, up into the blistering wind with nothing to protect his slight frame except a light anorak, a scarf, and a couple of trekking poles to fend off the Zeppelins. I hope I’m as active as he is when I’ve reached his age. And that’s the Wain Stones on a cold day in February. Not the longest or most spectacular of walks, but one that seemed fitting in the circumstances. Now I’m off home to cook dinner for my wife and raise a glass to Ewan MacColl. Incidentally, MacColl wrote The Manchester Rambler in celebration of the mass trespass on Kinder Scout during the 1930s. He was involved with planning a series of trespasses and was responsible for publicity. If it wasn’t for people like him our uplands would still be the exclusive playgrounds of the privileged – and walkers would be routinely beaten by red-necked, forelock-tugging gamekeepers wielding big sticks. So I might raise several glasses. Just don’t ask me to sing The Manchester Rambler. 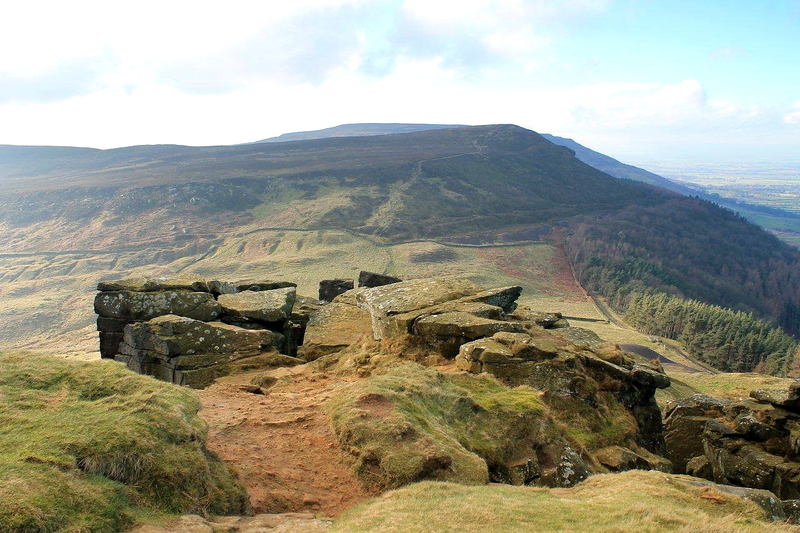 This entry was posted in Archaeology, Bronze Age, Cleveland Way, Climbing, Cup and ring carvings, Environment, Ewan MacColl, Footpaths, Hiking, History, Legends, Mountains, Teesside, Vikings, Walking and tagged Cleveland Hills, North York Moors, outdoors, Pennines, WPLongform. Bookmark the permalink. Nice pics Alen. I’m lucky enough to have visited both sets of Wain Stones last year, partly because I’m reccying the Pennine Way, partly because I’m reccying the Coast to Coast but mostly just because I’m interested in such things. I think the Bleaklow Wain Stones are wierder and perhaps more of a curiousity bit the Cleveland Wain Stones are in an incomparably better location. I had a brilliant day running anf wealking from Ingleby Cross to Clay Bank over the Cleveland ridge and was kindly opicked up by my partner Gill (bless her) at the Clay Bank car park. It’s a wonderful route! Hi Andy. 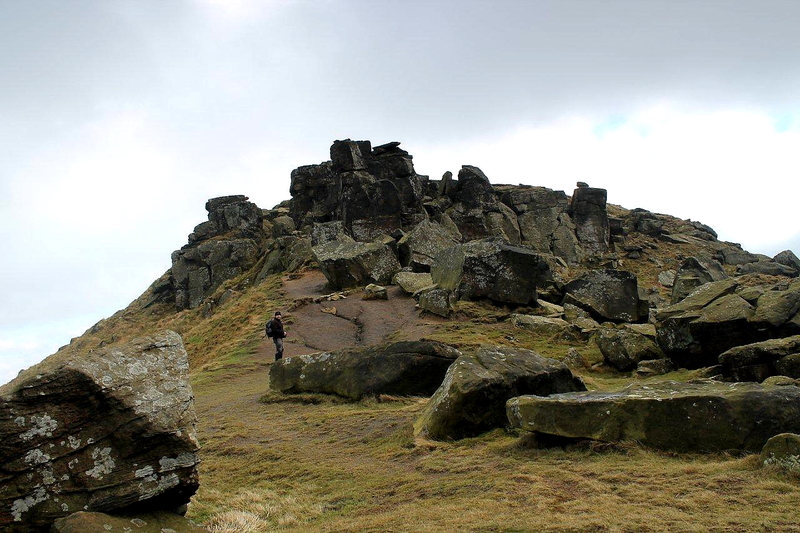 I think I’m going to have to visit the Bleaklow Wain Stones now out of curiosity. I don’t know that area at all but I could be down there in a couple of hours. Ingleby Cross to Clay Bank is quite some run. 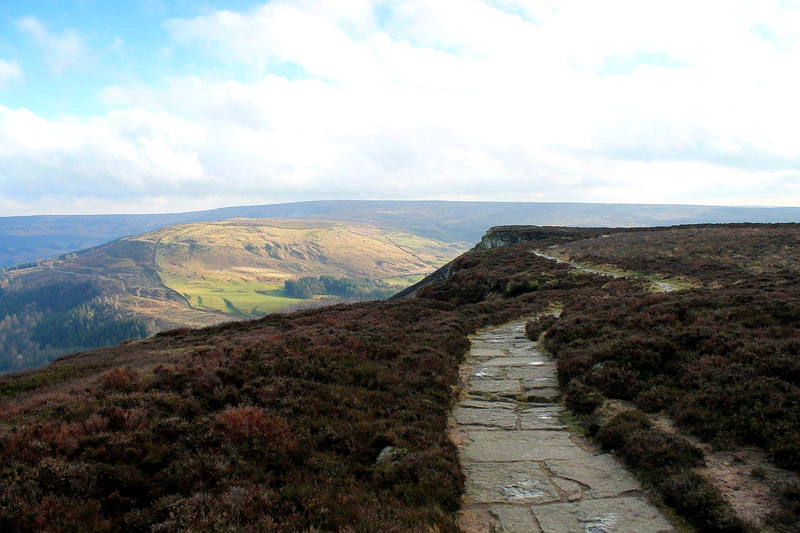 I’ve walked it as part of the Cleveland Way, which I did about 12 years ago, and found it very enjoyable. I even saw an adder sunning itself on the footpath up there. Not as warm and sunny as the Sierra Nevada, but very pleasant nonetheless. Another super post, Alen! 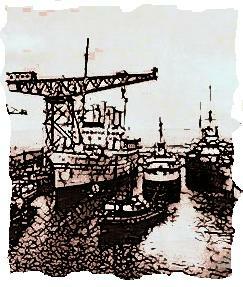 I like the mix of history, folk lore, geography and HUMOUR in your posts! Hi Charles. Thanks for that. Always look on the bright side of life, that’s what I say. Or did somebody else say that before me? Thanks for another splendid post, Alen. Your writing cheers me and inspires me to get outdoors. Hiya Will. I feel I’ve achieved something special when people feel inspired to get out of doors. Just don’t get washed away in a flood or blown over a cliff. I wouldn’t want that on my conscience! loving the post but what is vandalism and what is history?if someone posted their initials years ago why is that different from now? Blimey. It’s my old colleague Ms Benson, writing all the way from Merseyside where the walls are daubed with history. A very good point and one I shall ponder over. Might even do a post on the subject when I’ve come up with a good argument. Yes, maybe them in a hundred years will be amazed that people went up these eminences at all, as all of us will have atrophied little leggies and be built into wheels from birth. Time’s perspective … like the ferret recipe. I remember, Mrs Potter, circa 1966, a teacher of mine called Mr Ramsay saying that the human form will evolve into a big head with little tiny legs, because we will be beings who use our minds but do nothing physical. Perhaps he should have carved that into a rock. I wish he had, because I bet I’m the only one who remembers it. 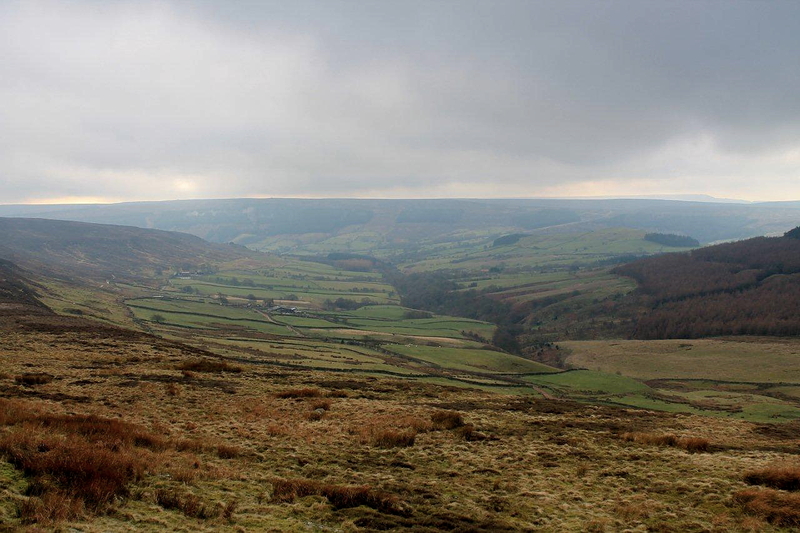 I had exactly the same misconception and was very pleased when I came across the Cleveland version on my C2C a few years ago….a month or two later I found out Ewan’s versions were much nearer my doorstep, still it gave me an excuse to get up on Bleaklow! Hi Howellsey. I wonder how many more people thought the same thing? Now I’m really going to have to get down there and climb up to the other set. Hi Iain. It’s great walking. Not too much upping and downing, just right for an afternoon’s stroll. And nearly as cold as Norway. Great photos with nice night – I especially like the second one and then the ones where you’ve reached the stones. 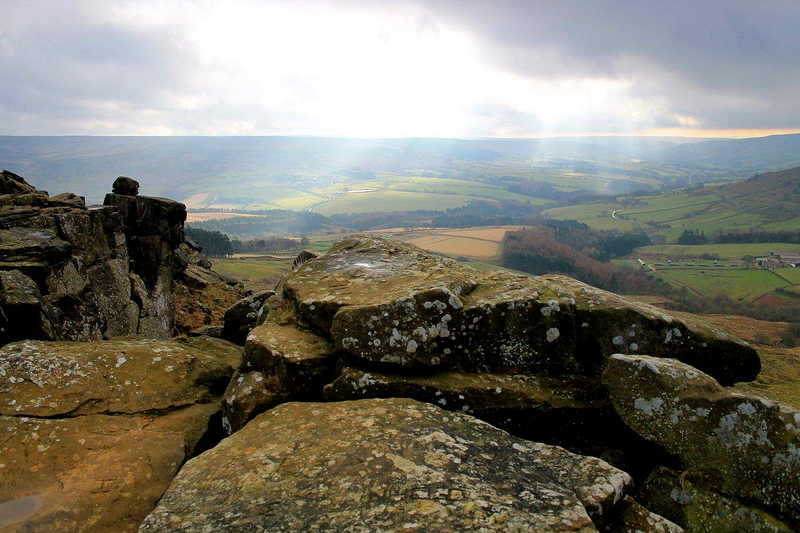 I’m hopeless climbing on gritstone – it’s a particular skill and not one of mine! It’s just too rounded for me. As to carving your name – that made me blush a bit as I tried to carve my name on the rocks on our local crag summit tors. I thought that I should really as all my (mainly long-dead) ancestors and relatives, and all the long-gone real locals of the village are carved up there and now there’s no-one like that left around here. We’re completely populated by offcumdens nowadays (as well them) and all the ‘local locals’ (as I call them) are long gone unfortunately 😦 Anyway, I didn’t have a chisel so sat for an afternoon with a sharp stone and just about made an impression of my initials. I’ve been back to look in later years and it’s long gone! Hi Carol. I think I might have to bow to popular opinion here over the carving of initials thing, because the two comments regarding it so far are both in its favour. Perhaps initials carved into stones will in themselves become historical records one day – and the more I think about it the more it makes sense. So perhaps I should go t’t foot of our stairs. 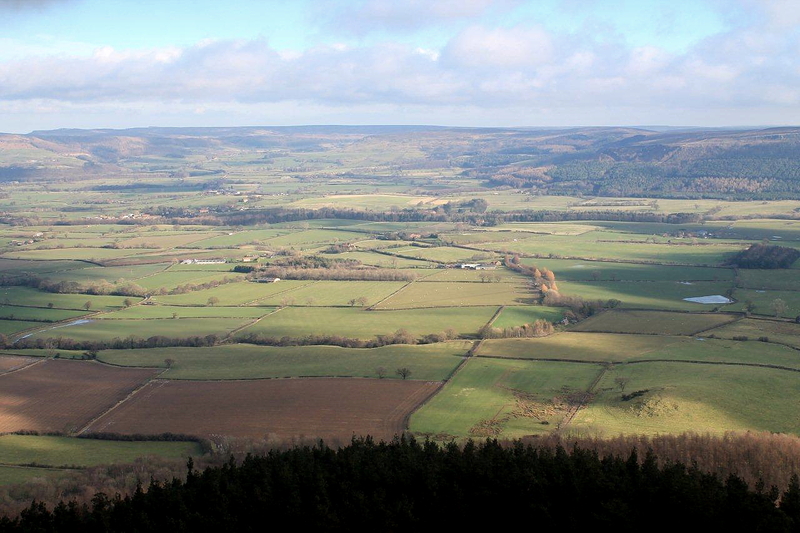 It’s my turn to blush a bit now, because you can see the North York Moors from the hill behind our house but I’ve done very little walking in them during the 18 years we’ve lived here. They are only half an hour’s drive away. And they are great walking and full of history. 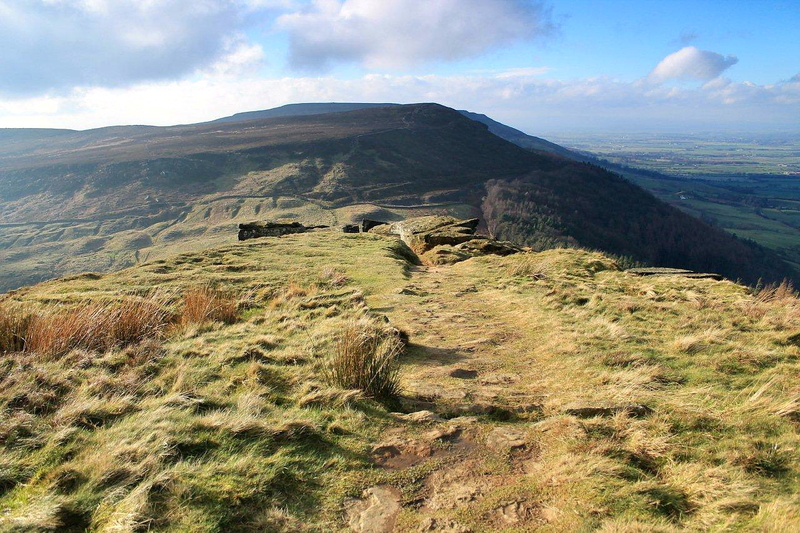 The Cleveland Way is one of my favourite LDPs because it embraces such a rich contrast of landscapes – from broad moorland to pleasant farmland to impressive clifftop seascapes. So get yourselves over here. PS I once carved the initials of a girl I fancied into a tree near Mireside just north of Broughton-in-Furness. I expect it’s grown over now so I don’t feel too bad about it. ref my above comment – no idea where ‘(as well them)’ came from as I actually typed ‘(as we call them)’ LOL – my computer must have had a momentary lock out and, being a touch typist, I didn’t notice a bit had gone missing! If that had been me I’d have blamed my new laptop, which has a mind of its own and inserts letters and omits letters at will. It also hasn’t got a spellcheck facility – or if it has then I can’t find it. I’m not keen on spellcheck as I can spell perfectly well and I think it really slows them down. But I agree they’re probably a good idea for typos and the like. Some grand elevated views from up there Alen. Those hills always seem a lot higher than they are due to the flat plains beyond. The carving of names is a bit of a difficult one. I find those little glimpses of history quite interesting, but I still stand firmly on the side of the fence that says leave things natural and leave no trace. Then again I seem to be completely out of kilter with the way most folk think nowadays so there you go. Ah, an ally. Thanks for that David. People have changed. Funny how they communicate with one another these days. I drove past a queue of secondary school pupils waiting for a bus the other day and they were all fiddling with their phones. Absolutely no conversation between them. Suddenly I feel like I’ve been abandoned on a strange planet. Thank god the hills remain the same. Mostly. Your gorilla walks makes you feel good, Alen. I enjoyed your story. Your reasoning regarding modern petroglyphs and Mr E Creighton with a revolver! Haha! I also understand that it is a good thing to bring walking canes to combat zeppelins. I’ll remember that if I ever wandering among the Wain Stones. Ah Hanna, people who walk like gorillas always feel good. It’s a matter of getting into the swing of things. Yes, the Wain Stones are an interesting feature, with ancient and modern petroglyphs, armed walkers and aerial bombardments. I bet you don’t get all those in one place in Denmark! You’re welcome, Alen. It’s a lovely humorous tale with many beautiful pictures. What a superb blog and a great post too! The photographs are superb and you really make me want to walk up there again – not been there since I was a kid. That’s gonna change! Hi there Smackedpentax. Thanks very much for your comment. Hope you have a warmer day for your visit to the Wain Stones. Great post and pics, Alen. 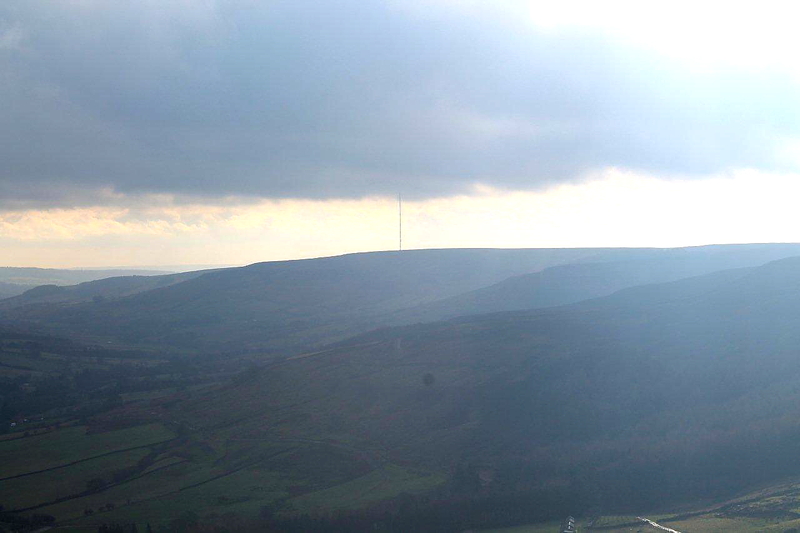 It looks very blustery! I love that rock formation. I am in two minds about carving your initials in rocks. I would never do it, but at what stage does it become history? It’s like demolishing buildings that we now think are eyesores, as they did in the 1960s – but how many would have been listed today? A perplexing little question! 🙂 PS Until fairly recently I used to think Joni Mitchell was singing about Woodstock in Oxfordshire, if that is any consolation. Jo, I laughed out loud at the Joni Mitchell admission. Having said that, I didn’t realise Woodstock was one of her songs. I was brought up on the Matthews Southern Comfort version, which got to No 1 if I remember correctly. It was one of the first songs I learnt to play on the guitar. I’ve just watched Joni Mitchell singing it live on Youtube, and I must admit she has a wider vocal range than me. She’s a bit better looking as well. Good point about the buildings. I suppose the graffiti in Pompeii and the Viking graffiti in MaesHowe, on Orkney, are valuable historical records. Perhaps I should have a rethink on this issue. So many buildings are built from a similar coloured stone that those rock formations start to look almost man made, like citadels. I always enjoy reading about what the earlier generations got up to, whether it’s vandalising bits of the environment or fighting the Bosch with umbrellas. You have inspired me to go outdoors now. I’m going to put on my plus fours, go up to the Lake District and see if I can bag a couple of stray Messerschmidts flying over Helm Crag! Hi Chris. Be careful. And take a pitchfork with you just in case you get the opportunity to capture some paratroopers. Nowhere and nobody is safe these days. 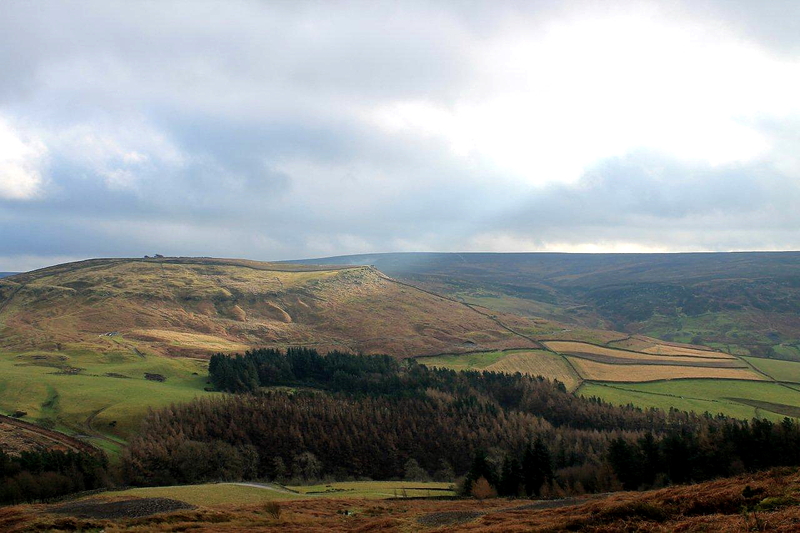 Great blog, lovely pictures, fascinating history and beautifully written as ever, Alen. Are you familiar with Ewan MacColl’s The Joy of Living? I read it for my Dad’s funeral. Also a celebration of the outdoors and freedom. 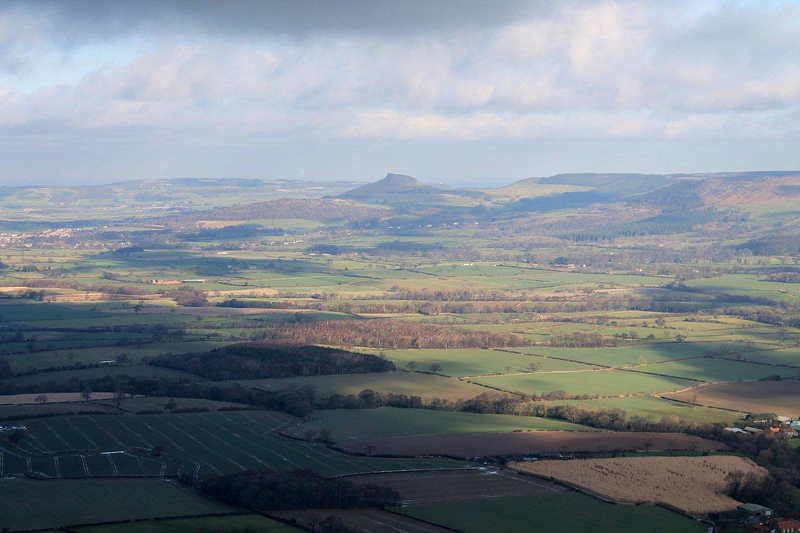 Also, my husband, a Yorkshireman, says you’re right about the Cleveland Hills, and that the Hambledon Hills are the southern part of the North York Moors National Park! Hi there Slipperywitch. Good to hear from you. And no, The Joy of Living is a new one on me. I’ve just been listening to it on Youtube. What a powerful song! I think I should familiarise myself with more of Ewan’s songs because I’ve been dipping into them in the past couple of days and there’s a wealth of material out there. Just as a by the way – I actually first heard Joy of Living sung by Rory MacLeod. If you haven’t come across this guy, I highly recommend him. A real troubador who writes great lyrics of his own. Try ‘Mouth to Mouth’ and check out http://www.rorymacleod.com.